The Oceans West Condominium is located in Daytona Beach Shores just north of the Dunlawton Bridge! The 2 tower condo complex provides some of the most awesome views of the Halifax River! Oceanviews can also be seen from units on the 7th floor and up. The building is just steps to Publix, a 13 hole 3 par golf course, tennis, banking, and restaurants! 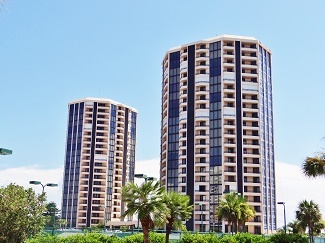 These 22 story towers allow 2 pets up to 20 lbs and have a 3 month minimum rental policy. Oceans West condos is just what you are looking for if you are considering retirement! Live a luxury condo lifestyle for a fraction of the cost! Don't miss the affordable opportunites starting in the mid $100K!